The BBC are at it again and by ‘at it’ I mean talking about language evolution! Hello! The BBC are at it again and by ‘at it’ I mean talking about language evolution! The latest episode of ‘Origins of Us’, which is a series about human evolution from an anthropological/archaeological angle, is on brains. 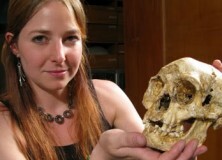 The program is presented by Alice Roberts and she doesn’t do a bad job of discussing the issues relating to the lack of direct fossil evidence for language. She discusses the anatomy used in speech which is something which Stephen Fry did not do in his program on the origins of language. We also get an excellent rendition of the cardinal vowels from Dr. Roberts! She also discusses the role of language in symbolic thought and there is a wee bit at the end on cultural evolution. The part of the program on language starts about 25 minutes in, but I’d suggest watching the whole thing as all aspects of the evolution of the brain are relevant to language evolution, and also, it’s bloody interesting. Next Next post: Great Andamanese: The key to more than one linguistic puzzle?